On 1 April, Chief Cabinet Secretary (i.e. 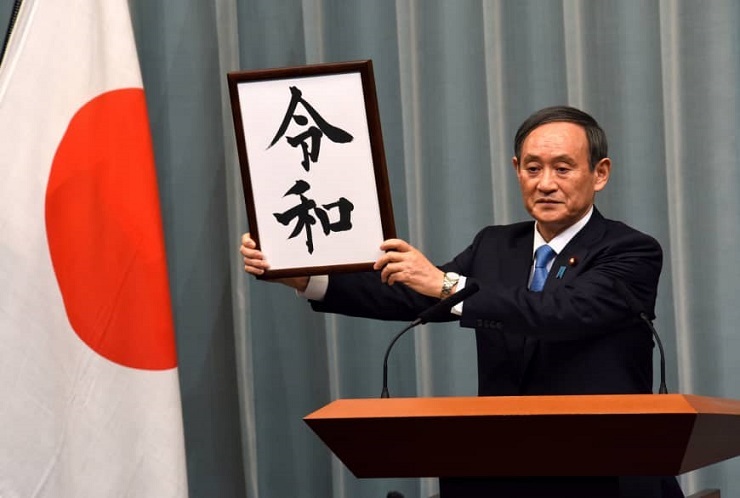 head of the executive body under the Prime Minister), Yoshihide Suga, showed journalists two kanji characters, written in calligraphy, that represent the name of the country’s new epoch. They have been adopted from ancient Japanese poetry, and in Latin alphabet the characters depict the word Reiwa. The name of the new epoch, which will dawn for the nation on 1 May of this year, was selected by a special committee, approved by both chambers of the National Diet of Japan (its parliament) and revealed to the next emperor, Crown Prince Naruhito. The latter will ascend to the throne (on 1 May too), replacing his father Akihito, who reigned during the Heisei epoch since January 1989. According to ancient tradition, on passing they will both be referred to by the names of their epochs in Japan’s annals of history. Several interpretations of the meaning behind the characters Reiwa appeared shortly afterwards. The most accurate of these is considered to be the one proposed by Japan’s Prime Minister Shinzō Abe “Our nation’s culture is born and nourished by people’s hearts being drawn beautifully together”. For the author of this article the kanji characters themselves, representing the name of Japan’s new epoch, represent nothing more but a beautiful label for a truly new image of the country, which has been taking shape during the entire post-war period. There was a need for a symbolic depiction of internal radical changes that have taken place in Japan and of its return (as well as Germany’s) to the forefront of the “Global Chess Game” as one of its main participants. Using the position it has reached, the nation will be able to handle new internal and external challenges, under the guidance of the symbols (extremely important for Japan) representing the reign of the new emperor. And although the reasons for Emperor Akihito’s abdication from the throne (the second in the history of the nation) seem quite convincing (the ruler is 85 years old, he has had long-term health problems and has undergone complex surgical procedures), the presence of another motive – new challenges should be faced under the leadership (even if symbolic) of a new emperor – is readily apparent. Currently, Japan’s nominal GDP is in third place globally, and its economy remains a key tool among the instruments the nation uses to compete on the international stage (quite successfully) in order to protect its national political interests. And although, since the turn of the 1980s there has been a sharp (in comparison to the first post-war decades) fall in the rate of change of numerical growth indicators of the Japanese economy (often blamed on the system responsible for artificially decreasing the exchange rate value of the dollar versus other convertible currencies, including the yen, adopted in 1985), its quality indicators continued to improve. According to the Flying geese paradigm, created before the war, Japan was at the origin of creation of new leading economies on the continent, i.e. the so-called Tiger Cub Economies. Up to now the latter, including China, would have hardly been able to manage without collaboration with leading Japanese financial and manufacturing conglomerates, from which they receive unique components and materials for their production companies. Japan’s position in the region and the entire world was quickly consolidated when the Comprehensive and Progressive for the Trans-Pacific Partnership (CPTPP) entered into force on 30 December 2018. We would like to remind our readers that after U.S. President Donald Trump abandoned the initiative, then referred to by its shorter name, the Trans-Pacific Partnership (TPP), at the beginning of 2017, many thought that the TPP was finished. The fact that the project was resurrected from (nearly) its death throes is, almost entirely, an achievement of the Japanese government, and first and foremost, of its Prime Minister Shinzō Abe. At present, the CPTPP includes 11 countries, whose share of the global GDP constitutes 13.5%. It is important to highlight that Japan is the unspoken leader of the alliance, which already plays an important role in not only economic but political processes taking place in the world. Therefore, the prominence of CPTPP, and, in turn, of Japan, will only rise as means of integration within the alliance will continue to develop and new nations will join the organization. Since 2010, Colombia, the Philippines, Taiwan, South Korea, Thailand and Indonesia have expressed their wish to join the CPTPP. The government of Great Britain has mentioned similar intentions, as the date the UK is set to leave the European Union approaches. Incidentally, such a step by London could become, among other things, Great Britain’s roundabout way of (quasi-) returning to the EU. Since, at the beginning of 2019, the Economic Partnership Agreement on creation of a free trade zone and on security cooperation between the EU and Japan came into force. In other words, the prospect of close collaboration between the EU and the CPTPP is quite likely. For now, in this uncertain Brexit environment, which is yet to change, Japanese businesses have started to reduce their presence in the British market. In February, Honda Motor Co. announced that it would close its factory, which employs 3,500 British citizens. In March, corporate giants, such as Mitsubishi, Toyota and Nissan, stated similar intentions. On 3 April, Japan and Britain announced that they would indefinitely postpone (again because of the uncertainty associated with the Brexit process) the ministerial security talks, which were scheduled to take place that same month. In its own region, Japan’s primary concern is to develop an optimal strategy for its future relations with two other world powers, i.e. the United States and China. The fact that Japan’s role in regional affairs is rapidly gaining prominence is evidenced in the appointment of a new Chinese ambassador, PRC’s Vice Foreign Minister Kong Xuanyou, to Tokyo. One of the most pressing matters in the realm of Japan’s internal politics is the challenge of introducing amendments to the anti-war Article 9 of the Japanese Constitution from 1947. Justifiably, the resolution of this issue is often portrayed as the main goal of the entire political career of Shinzō Abe, who is already viewed as one of the most respected government officials in Japan during the post-war period. Hence, It is not a coincidence that in March of this year, the leadership of the Ruling Liberal Democratic Party (LDP) leaked information about the possibility (which the Prime MInister has rejected) of Shinzo Abe serving as the head of the party for a fourth term to media outlets in order to test the waters. Even his election, in autumn 2018, for the third term (which will end in summer 2021) was a departure from the LDP rules. Currently, the same assertion is being voiced as last year that no one but Shinzo Abe will be able to resolve the highly complex internal and external issues, facing the nation, equally effectively. It is possible that one of the biggest challenges in the realm of internal politics could stem from the overhaul of the Immigration Control and Refugee Recognition Act, adopted as far back as 1951, by the National Diet in December of last year. The aim of the legislative changes (which came into force on 1 April of this year) is to give foreigners the right to remain in Japan for a long period of time legally. These aliens are, first and foremost, expected to fill poorly paid and undesirable job positions. This was a forced measure, as Japan is not only one of the most prosperous countries, but is also in the lead when it comes to the size of its ageing population and low birth rates. At present, it is not possible to forecast what effect the arrival of large numbers of migrant workers (for now limited to under half a million) will have on the nation’s ability to maintain stability within its borders. Many of the immigrants will have an opportunity to bring their immediate families along. Since the Middle Ages, Japanese people have had a wary attitude towards any attempts by foreigners to settle down in their country (as opposed to their truly welcoming nature when it comes to mass tourism). This unease even applies to Koreans, many of whom, during the war in the Pacific Ocean, were kamikaze pilots, served in the Imperial Army and did the toughest work in Japan’s manufacturing facilities. Japan is truly entering its new epoch as a nation propelled to prominence in the global political landscape that is undergoing radical transformation. At the same time, the country is also experiencing a variety of significant changes within its borders. There is an awareness in Japan that the nation is taking an important step forward and moving beyond the post-war period. Understanding what is happening inside and outside of your country in time is vital and so is being prepared to respond to challenges that arise. And the symbolic depiction of the new era is a natural way of establishing a connection with the very origins of Japan’s national culture.